Kathy Larson, Frontier’s VP of Sustainability, took a walk through the tallgrass prairie at our Norway, Iowa headquarters with her camera in hand recently, and shares her experience and photos with us here. She’s agreed to return regularly (it’s a tough job, but someone has to do it) to chronicle the prairie’s changes throughout the year. 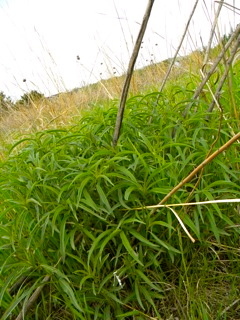 With both a strong warm breeze out of the southeast and gathering clouds foreshadowing rain, I stroll out to the Frontier tallgrass prairie to see which plants are growing and which are blooming. 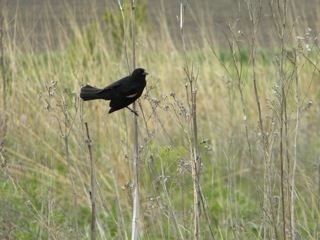 I notice many remnants of last year’s foliage, including tall stalks of compass plant and ironweed, which are the favorites of the redwing blackbirds. The birds perch atop the stalks to survey their territory and noisily warn away competitors — and they obviously consider me one. Bunches of dried grasses, still standing tall throughout the landscape, hide much of the new plant growth, but it’s there. Many plants, like gentian and mondarda, are just starting to poke their heads out from the soil. 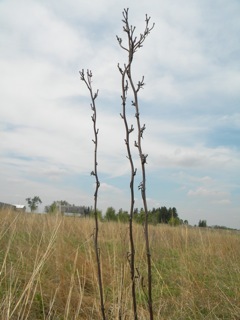 Others, like the Maximillan sunflowers, are already nearly a foot tall, with last year’s flowering stalks rising from the center of the new green leaves. 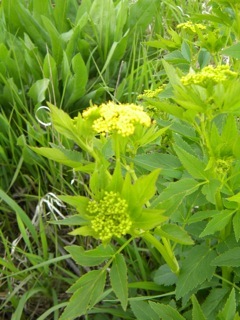 The only prairie plant I can find that is flowering this early is Golden Alexanders (Zizia aurea), a member of the carrot family. The plants are just starting to bloom. When fully opened, their bright yellow clusters of flowers will provide a source of nectar for many types of bees, wasps and small butterflies. 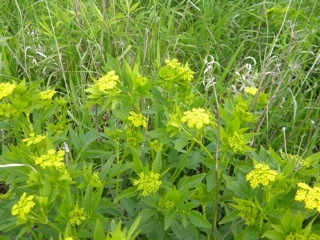 Golden Alexanders grows in moist prairies and abandoned fields and is scattered throughout the lower and wetter parts of our prairie. 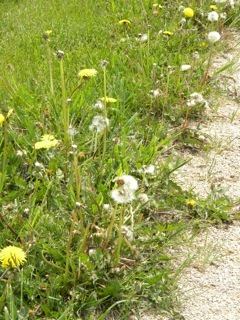 Along the walking trail that circles the prairie, the dandelions are blooming with plenty of sunny yellow flowers — and almost as many fluffy seed heads, ready to be spread afar on the spring breezes. 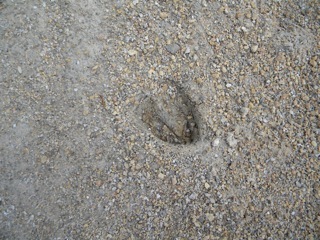 I see that Frontier employees are not the only ones to walk the prairie trail. 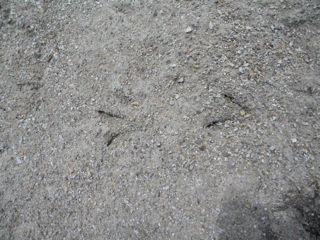 Tracks from pheasants and deer crisscross it too. It’s a pleasure to walk across this vibrant and diverse prairie. I’ll try to return often and share what I find there with you. 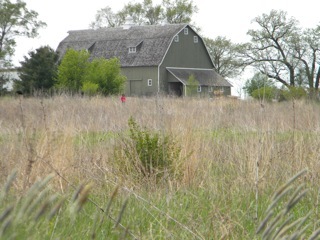 This entry was posted in At the source, Sustainability and tagged employee benefits, Frontier, Iowa, Kathy Larson, natural living, photos, Sustainability, tallgrass prairie by Cayenne Room. Bookmark the permalink.